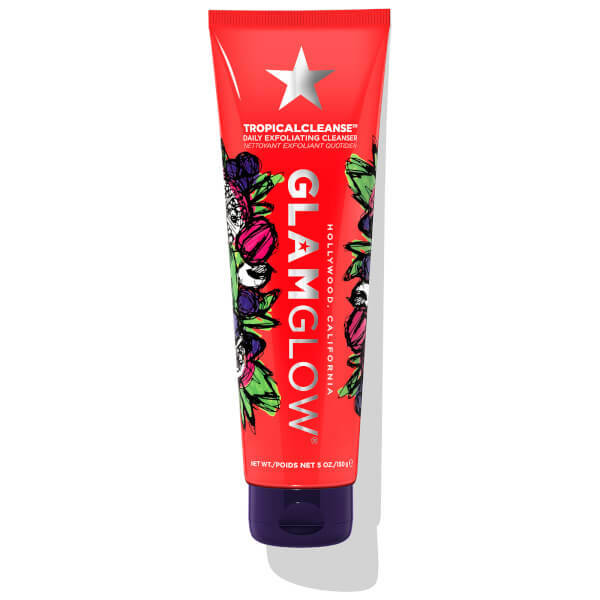 Restore skin’s glow with the GLAMGLOW Tropical Cleanse; a daily exfoliating cleanser with a gritty texture that gently polishes skin, ridding pores of dirt, pollutants, dead skin and traces of makeup without stripping for a refined, even surface and renewed radiance. 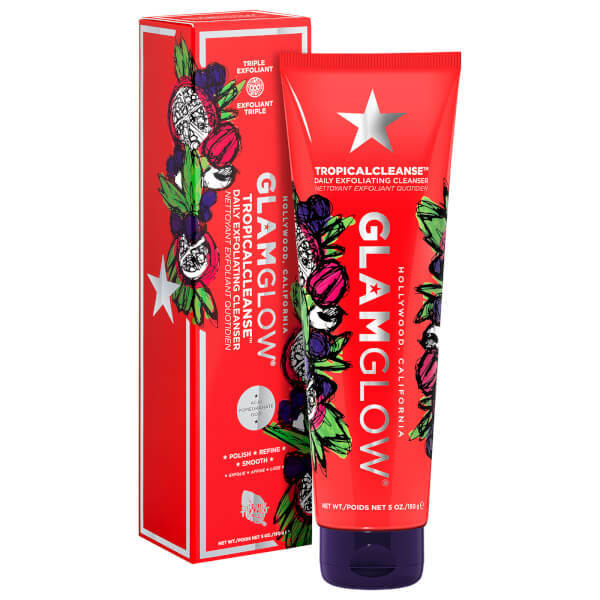 Powered by a powerful blend of nutrient-packed super-fruits (Acai, Acerola and Goji Berry) combined with Purple Clay and TEAOXI® Green Tea Leaf to deeply nourish, brighten and draw out impurities, the cleanser revitalises the complexion with a triple exfoliating blend of tropical fruit enzymes and extracts, including Pomegranate Seeds. Skin appears refreshed with revived luminosity. Free from parabens, phthalates and sulphates. 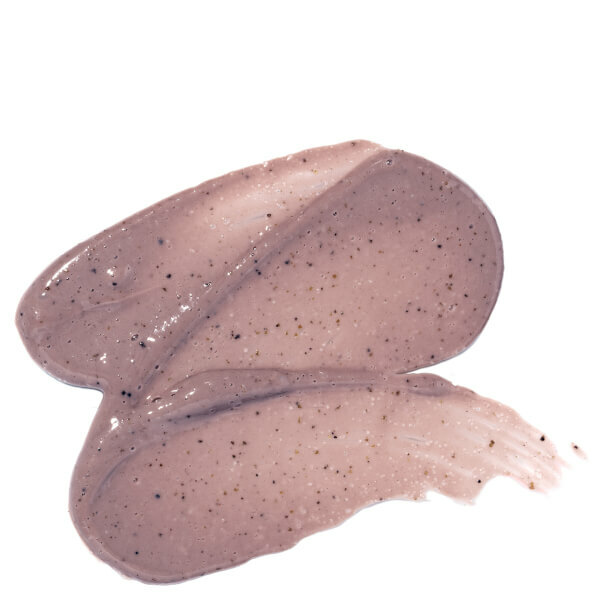 Apply to wet face and gently massage evenly in circular motions to exfoliate. Rinse well and pat dry. Use daily as desired. Avoid eye area. Water\Aqua\Eau, Sodium C14-16 Olefin Sulfonate, Magnesium Aluminum Silicate, Kaolin, Sodium Cocoamphoacetate, Cetearyl Alcohol, Glyceryl Stearate, Glycerin, Microcrystalline Cellulose, Propanediol, Euterpe Oleracea Fruit Extract, Punica Granatum Fruit Extract, Punica Granatum (Pomegranate) Seed Powder, Lycium Barbarum Fruit Extract, Camellia Sinensis Leaf Extract, Camellia Sinensis (Green Tea) Leaf Powder, Malpighia Glabra (Acerola) Fruit Extract, Vaccinium Myrtillus Fruit Extract, Salix Nigra (Willow) Bark Extract  Saccharum Officinarum (Sugar Cane) Extract\Extrait De Canne A Sucre  Ginkgo Biloba Leaf Powder, Lavandula Angustifolia (Lavender) Flower/Leaf/Stem Extract, Citrus Limon (Lemon) Fruit Extract, Citrus Aurantium Dulcis (Orange) Fruit Extract, Coffea Arabica (Coffee) Seed Extract, Pyrus Malus (Apple) Fruit Extract, Rubus Idaeus (Raspberry) Fruit Extract, Elettaria Cardamomum Seed Extract, Acer Saccharum (Sugar Maple) Extract, Paullinia Cupana Seed Extract, Carica Papaya (Papaya) Fruit Extract, Cucumis Sativus (Cucumber) Fruit Extract, Salvia Officinalis (Sage) Leaf Extract, Fucus Vesiculosus Extract, Rosmarinus Officinalis (Rosemary) Leaf Extract, Citrus Aurantium Amara (Bitter Orange) Flower Extract, Cucumis Melo (Melon) Fruit Extract, Rosa Centifolia Flower Extract, Jasminum Officinale (Jasmine) Flower Extract, Santalum Album (Sandalwood) Wood Extract, Cananga Odorata Flower Extract, Cupressus Sempervirens Leaf/Nut/Stem Oil, Morinda Citrifolia Fruit Extract, Garcinia Mangostana Fruit Extract, Papain, Hydrolyzed Quinoa, Hydrolyzed Linseed Seed, Tocopheryl Acetate, Bromelain, Ethylhexylglycerin, Triethyl Citrate, Citric Acid, Xanthan Gum, Cocamidopropyl Hydroxysultaine, Maltodextrin, Sodium Chloride, Algin, Disodium Adenosine Triphosphate, Diatomaceous Earth\Solum Diatomeae\Terre De Diatomees [Caprylyl Glycol, Fragrance (Parfum), Linalool, Hexyl Cinnamal, Hydroxyacetophenone, Phytic Acid, Phenoxyethanol.